Continued partnering with several financial institutions and non-profits to assist clients with lower than average credit scores to buy a home. Launched a pilot Neighborhood Empowerment Zone (NEZ) to incentivize new condo/townhome development in Northchase via waiving of development related fees. Tax Increment Reinvestment Zone #3 (North End TIRZ) created in 2008 with participation from Smith County and Tyler Junior College. Completed Texas College Area Development Plan. Total of 4 Section 8 families assisted with homeownership. 4 families assisted with buying home without Section 8 assistance with City’s First-Time Homebuyers Program. New Neighborhood Services building on W. Gentry purchased to establish a central information center on the affordable housing programs. Assisted with the rehabilitation of 89 52 homes in the North End. Coordinated construction of 15 3 new single-family homes in the North End. $257,610264,082 provided to North End homebuyers for down payment assistance. Most of Tyler’s housing is composed of single-family houses. 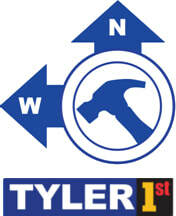 The homeownership rate for Tyler is lower than the statewide rate of 63%. The downward trend in the average price for an existing single-family home has ended, and prices are beginning to trend higher than pre-recession levels. New houses are, on average, much larger and more expensive than existing homes. Nearly half of Tyler’s households do not receive enough income to afford the median-priced single-family home. ​The majority of new development in Tyler is taking place in the southern part of the city.